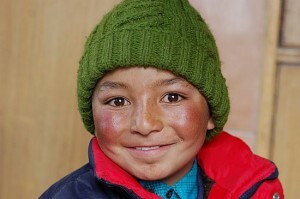 We have a number of wonderful sponsors who have set up a monthly standing order to Himalayan Children. Some sponsors donate a set amount per month to go towards the general fund for our sponsored children. Others prefer to sponsor an individual child and either make monthly donations or make a one-off payment per year for their child. Kathy & Dave and Debbie tell their story below – if you would like to help too, please visit our how you can help page or contact us for more information. At a time when many charities are under intense pressure to justify how they spend every single penny that’s donated to them, Himalayan Children works in a refreshingly simple way. No glitzy marketing campaigns, no swanky offices, and no CEO on a big fat salary. Everything donated to this charity is spent on providing education for children who would not otherwise enjoy that gift. Seeing exactly how the money we give has been spent – including receiving letters from the child our donation has helped go to school – makes this charity special. We know we’re making a positive difference to a child’s future. That’s why we sponsor a child though Himalayan Children. It is Gail’s passion to improve the lives of children and their families from her visits to Ladakh and the surrounding areas. She has shared life with her hosts, so she knows just how tough life can be for them. Sharing her experiences upon her return I thought it would be nice to support Himalyan Children, and rather than jumping on a plane and experiencing it for myself, I opted for sponsorship. Gail gave me a choice of children to sponsor and I chose to sponsor J. She was 3 at the time and I am now in my third year of sponsorship. I get regular updates of how J is doing at school it is encouraging to hear about her success and that she is enjoying school. The beauty of this charity is that everything is accountable. Gail regularly visits and sends me photos of the family, which creates a family connection between our two families. I send them a letter with all my news and J is thrilled to receive these and proudly has her photo taken holding photos that I have sent of my family and Tom the puppy. I do believe that sponsorship will make a profound difference to J’s life, family and community.